From 1988 through 2016, the world-renowned Pobjoy Mint released a series of proofs specifically for coin collectors who also happen to love those furry felines we love to call our pets and companions. Issued on behalf of the Isle of Man, the series became a massive hit soon after the first coin was released. In fact, the award-winning series, which depicted a one-year-only design of a different cat each year, has since become regarded as Pobjoy’s most popular and top-selling series. 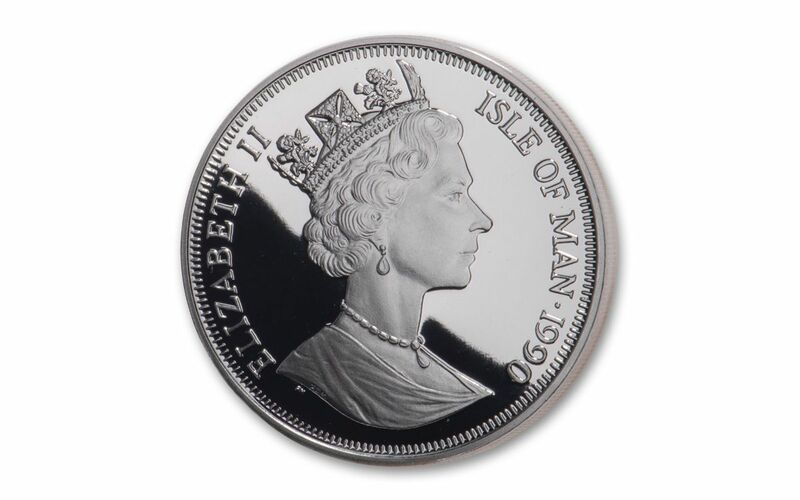 Now you can add the key-date third year coin in the series to your collection with this 1990 Isle of Man Alley Cat Silver Proof. 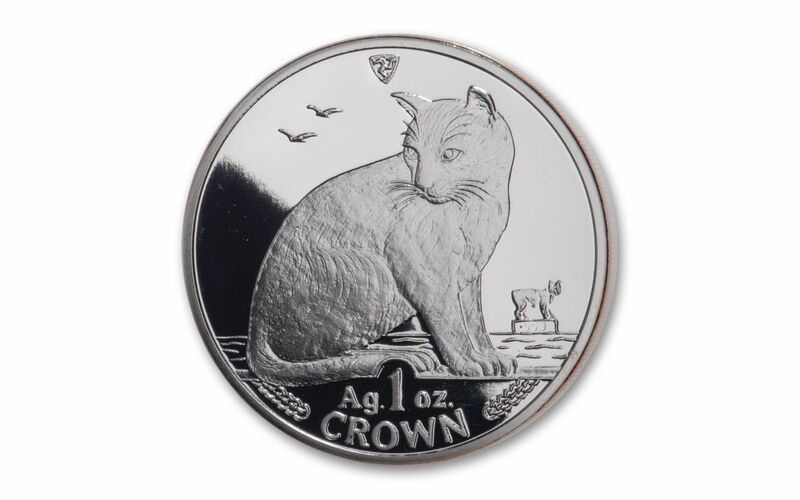 Struck in a Troy ounce of highly-pure 99.9% silver, this legal-tender coin bears a denomination of 1 Crown and celebrates the plucky nature of one of life’s greatest survivors: The Alley Cat. Expertly crafted by the artisans at the Pobjoy Mint, the coin’s proof finish is the result of hand-selected planchets, polished dies and multiple strikes to produce beautifully frosted details rising over mirror-like fields. They may have mixed ancestry and they may have no home but what they do have is the ability to adapt to anything life throws at them. They’re Alley Cats and they have become famous in New York City, London and other large metropolitan areas for their ability to adapt to the hazards and pressures of big-city life better than practically any other animal – including humans! Anyone who has ever seen the popular “Top Cat” cartoon series or been to a performance of the Tony Award-winning musical Cats knows that these feline troopers are adept at melting the hearts of people in their neighborhood so that they never go long without a good meal and a kindly pat on the head. This proof has a limited mintage of just 50,000 coins, which is why we consider ourselves lucky to have secured the small hoard we have. Are you ready to order now, or do we need to break out the laser pointer? KEY THIRD YEAR OF POPULAR SERIES – The 1990 Isle of Man Alley Cat Silver Proof is the third release in the Pobjoy Mint’s popular cat series that ran from 1988-2016. The coin’s reverse depicts the Alley cat in splendid detail. The coin’s obverse features a profile of a young Queen Elizabeth II. 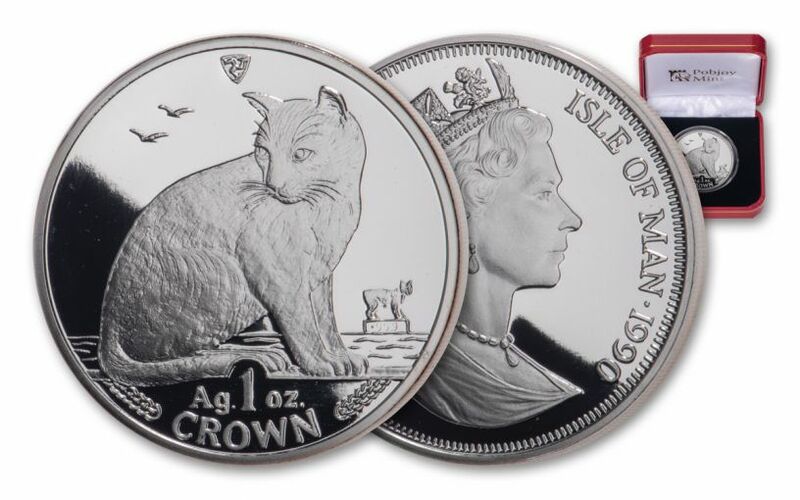 STRUCK IN HIGHLY-PURE SILVER – Each 1990 Isle of Man Alley Cat Silver Proof is struck in one ounce of highly-pure 99.9% silver. GORGEOUS PROOF CONDITION – Your 1990 Isle of Man Alley Cat One-Ounce Silver Proof was expertly crafted by the artisans at the Pobjoy Mint from hand-selected planchets, polished dies and multiple strikes to produce beautifully frosted details rising over mirror-like fields. LIMITED EDITION RELEASE – The worldwide limited edition of these coins was just 50,000. 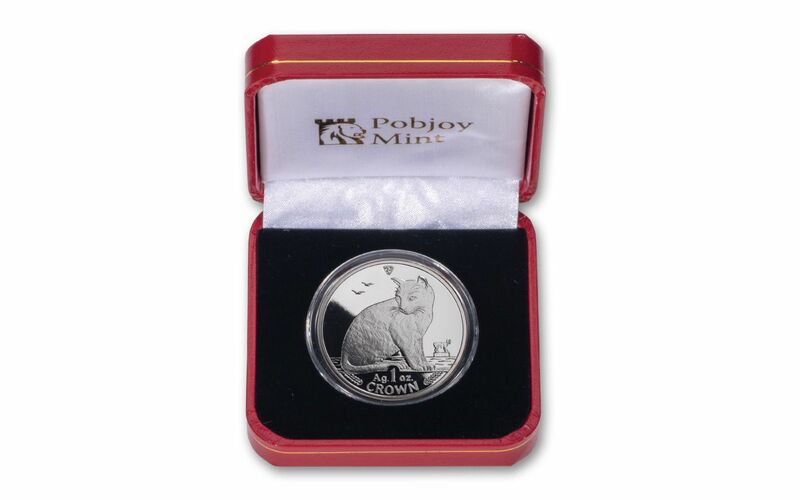 There are only a limited quantity of 1990 Alley Cat coins left in the Pobjoy Mint’s vaults. Once they are gone, no more will be struck – ever. Don’t miss out, order yours now!